These beautiful old windows ARE STILL IN THE original frames. Removed from a house in YORKSHIRE during refurbishement. 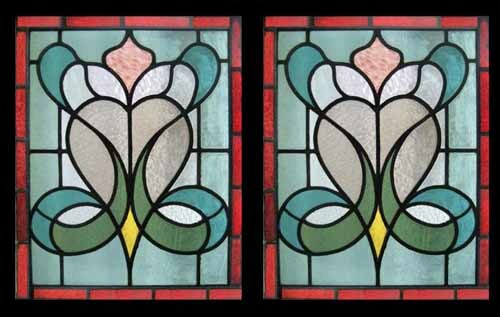 This is a LARGE SET OF windows of outstanding beauty with exceptional coloured glass. RARE TO FIND THIS BEAUTIFUL AND DELICATE SHADE OF PINKS AND VANILLAS. This coloured glass is of a heavy and deep texture. A BEAUTIFUL DESIGN - THESE LARGE SETS ARE BECOMING QUITE RARE AND THIS IS CERTAINLY VERY SPECIAL. BEAUTIFUL PEACH - PALE PINK - VANILLA - GREEN AND GOLD. The leads and glass are in sound condition. EACH SEPERATE frame measures 22 1/2 W" x 31 H" . The glass measures 19 " x 24 " .